Marcus Bingenheimer 馬德偉 was born in Germany. He obtained an MA (Sinology) and Dr.phil (History of Religions) from Würzburg University and an MA (Communication Studies) from Nagoya University. Marcus currently works as Associate Professor in the Department of Religion at Temple University, Philadelphia. From 2005 to 2011 he taught Buddhism and Digital Humanities in Taiwan. He has supervised various projects concerning the digitization of Buddhist culture and was responsible for the Chinese Localization of TEI. His main research interests are the history of Buddhism in East Asia and early Buddhist sutra literature. Regarding the former, he is currently assembling a dataset for the historical social network analysis of Chinese Buddhist history; regarding the latter, he is working on a translation of the Shorter Chinese Saṃyuktāgama (T.100). Besides that, Marcus is interested in computational approaches to the Humanities and how to do research in an age of digital information. As project director (since 2018): "Chinese Buddhist History as Network(s)" Creation of a foundational dataset for historical social network analysis of Chinese Buddhism. 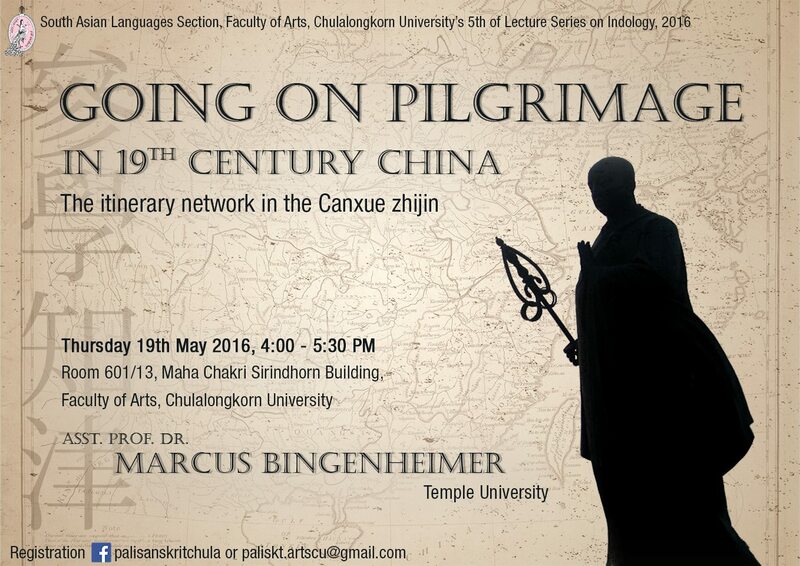 In collaboration with the Chung-hwa Institute of Buddhist Studies. First results here. Cluster Organizer (2016-2019) for Cluster 1.2 "Religion and Technology" in the project From the Ground Up - Buddhism and East Asian Religions. 1. Workshop 2017: "Space and Cyberspace - Using GIS in the Study of East Asian Religion". 2.Workshop 2018: "Social Network Analysis for the Study of Buddhism and East Asian Religions". As editor and translator (since 2005): A Translation of the Chinese Madhyama Āgama, the Zhong ahan jing 中阿含經 (T.26). This long-term translation project is funded by the Numata Foundation 仏教伝道協会. (See here.) The first of three volumes has been published (Oct. 2013). (2014-2017) As project director: "Four Early Chan Texts from Dunhuang - A TEI based Edition." Full-text digitization of selected Dunhuang manuscripts. Funded by the Chung-hwa Institute of Buddhist Studies, in collaboration with the International Dunhuang Project, British Library. Resulted in high-end digital editions of 43 Mss witnesses of four Early Chan texts. The texts are available online as part of the Database of Medieval Chinese Texts. The markup is documented in the Markup Manual. The XML/TEI Data is archived at Zenodo (DOI: 10.5281/zenodo.1133490). (2008-2013) As project director: Digital Archive of Chinese Buddhist Temple Gazetteers 中國佛教寺廟志數位典藏 . Phase I (2008-2011): Digitization of 230+ Buddhist temple gazetteers 中國佛寺志. Funded by the Chung-hwa Institute of Buddhist Studies 中華佛學研究學院. Phase II (2011-2013): From TEI/XML back to print: Zhonghua fosizhi congshu 中華佛寺志叢書 (The Zhonghua Collection of Buddhist Temple Gazetteers) (s.b.). (2008-2011) As managing director: Visualization platform for Buddhist Biographies 佛教傳記文學視覺化平台. The "One Dataset - Three Views" platform offers a GIS visualization and reading platform, a social network view, and a timeline view. Funded by the Haoran Foundation 浩然基金會. (2008-2011) As managing director: Authority databases for person and place names in Buddhist sources and East Asian calendar data. (2008-2010) As managing director: Spatio-temporal & image database of Buddhist Temples in Taiwan 台灣佛寺時空平台. Funded by the Haoran Foundation 浩然基金會. (2007-2009) As project director: "Catalog Database of Republican Era Buddhist Journals 『民 國 佛 教 期 刊 文 獻 集 成』 - 書目資料庫." A bibliographic database of more than 140,000 articles from Buddhist Journals of the Republican era. (2007-2008) As project director: Full-text and image file archive of the Journal Taiwan Fojiao　《臺灣佛教》 《臺灣佛教》期刊數位典藏 . Taiwan Fojiao is an important source for the study of Taiwanese Buddhism between 1950 and 1970. (2007-2008) As project director: Research Archive of Material on the Manchu Buddhist Canon 滿文藏經研究資料. Funded by the Li Chunjin Foundation 李春金關懷基金會. (2006-2009) As project director: The Chinese Localization of the TEI Markup standard. See book publication 2009 below and this website. Funded by the Taiwan e-Learning and Digital Archives Program 數位典藏與數位學習國家型科技計畫. (2005-2008) As project director: A comparative edition and partial translation of an early Chinese Āgama sutra, the Bieyi za'ahan jing 別譯雜阿含經 (T.100), a project funded by the Chiang Ching-Kuo Foundation for International Scholarly Exchange 蔣經國國際學術交流基金會 (RG005-D-04). 2018: Marcus Bingenheimer 馬德偉, Chang Po-Yung 張伯雍 (eds. ): Four Early Chan Texts from Dunhuang – A TEI-based Edition 早期禪宗文獻四部 —— 以TEI標記重訂敦煌寫卷：楞伽師資記，傳法寶紀，修心要論，觀心論. Taipei: Shin Wen Feng 新文豐. Vol. 1: Facsimiles and Diplomatic Transcription 摹寫版 (ISBN: 978-957-17-2274-0), Vol. 2: Parallel, Punctuated and Annotated Edition 對照與點注版 (ISBN: 978-957-17-2275-7), Vol. 3: Calligraphy Practice 抄經版 (ISBN: 978-957-17-2276-4). XML/TEI Data archived at Zenodo (DOI: 10.5281/zenodo.1133490). Can be ordered at the 新文豐 website. English intro here [pdf]. 2016: Island of Guanyin - Mount Putuo and its Gazetteers. London & New York: Oxford UP. [OUP Website], [Amazon]. ISBN-13: 978-0190456191. A 15 volume edition series of 12 temple gazetteers (15th to early 20th century) with introductions, modern punctuation, common era dates, detailed place and person name indices. For a description of the editorial principles see Editorial Principles (中文凡例), for a general introduction to the edition project see the Series Preface (中文通序). The collection contains the following gazetteers: No. 1: 清涼山志 Mount Qingliang Gazetteer, No. 2: 峨眉山志 Mount Emei Gazetteer, No. 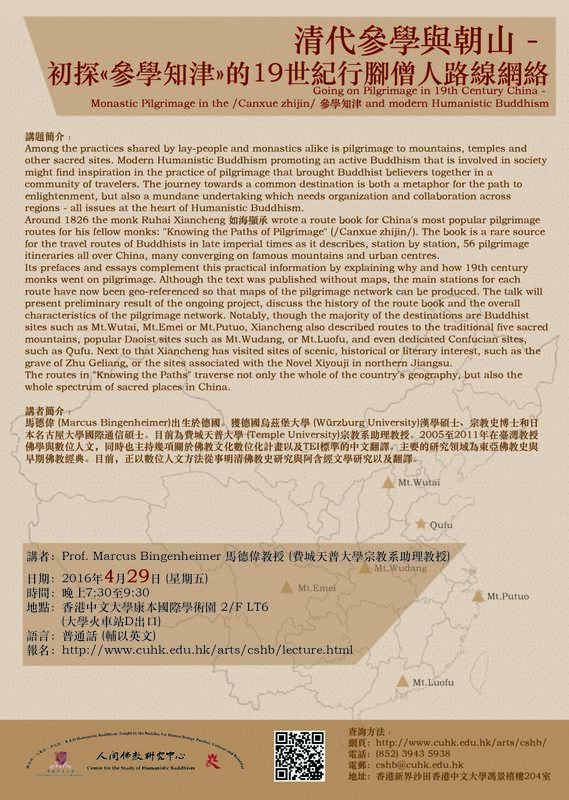 3: 重修普陀山志 Revised Gazetteer of Mount Putuo, No. 4: 普陀洛迦新志 New Gazetteer of Mount Putuo (2 Vols. ), No. 5: 九華山志 Mount Jiuhua Gazetteer, No. 6: 天台山方外志 Mount Tiantai Gazetteer (2 Vols. ), No. 7 A: 明州阿育王山志 Aśoka Temple Gazetteer, No. 7 B: 明州阿育王山續志 Continued Aśoka Temple Gazetteer, No. 8: 寒山寺志 Hanshan Temple Gazetteer, No. 9: 玉岑山慧因高麗華嚴教寺志 Huiyin Temple Gazetteer, No. 10: 黃檗山志 Mount Huangbo Gazetteer, No. 11: 泉州開元寺志 Kaiyuan Temple Gazetteer, No. 12: 雞足山志 Mount Jizu Gazetteer. Can be ordered at the 新文豐 website. 2013 (b) (Editor-in-chief, Translator): The Madhyama Āgama (Middle Length Discourses). Vol.1 Berkeley, CA: Numata Center for Buddhist Translation & Research. 588 pgs. Co-editors: Ven. Anālayo, Roderick Bucknell. The first of three volumes with the first English translation of the Zhong ahan jing 中阿含經 (T.26). This volume covers Vaggas 1-8, Fascicles 1-16, Sutras 1-71. On Amazon. ISBN: 978-1-886439-47-4. 2011: Studies in Āgama Literature - With special reference to the Shorter Chinese Saṃyuktāgama. Taipei: Shin Wen Feng 新文豐. 345 pgs. ISBN: 978-957-17-2139-2. Can be ordered from the 新文豐 website or downloaded here as PDF [2.3 MB]. 2009 (Editor-in-chief (總編輯) under the name 馬德偉): TEI shiyong zhinan - yunyong TEI chuli zhongwen wenxian TEI 使用指南──運用TEI處理中文文獻 [Chinese TEI – A guide to using TEI with Chinese texts]. Taipei: Taiwan E-learning and Digital Archive Program 數位典藏與數位學習國家型科技計畫. 384 pgs. ISBN:978-986-01-8092-3. This is the Chinese localization of the Text Encoding Initiative (TEI) markup standard. Download the book as PDF [7.5 MB]. Here is the introductory chapter in English. See the Chinese TEI website for more material on the standard. Heidelberg: Edition Forum (Würzburger Sinologische Schriften). 343 pgs. ISBN: 3-927943-26-6. The book is out of print, here is a (slightly revised) PDF-version. 2001: A Biographical Dictionary of the Japanese Student-Monks of the Seventh and Early Eighth Centuries. Their Travels to China and their Role in the Transmission of Buddhism. München: Iudicium (Buddhismus-Studien / Buddhist Studies 4). 138 pgs. ISBN: 3-89129-693-2. The book is out of print, here is a PDF-version. (forthcoming) “Digital Tools for Buddhist Studies” In: Christopher D. Cantwell and Kristian Petersen (eds. ), Introduction to Digital Humanities: Research Methods in the Study of Religion. Brill. 2018 (a): “Who was ‘Central’ for Chinese Buddhist History? - A Social Network Approach.” International Journal of Buddhist Thought and Culture. Vol.28-2 (Dec. 2018): 45-67. Open Access Journal Issues. Local copy. 2018 (b): “Digitization of Buddhist Cultural Heritage.” IIAS (International Institute for Asian Studies) Newsletter No.79 (Spring 2018): 20. Section here. 2017 (a): “Pilgrimage in China.” in: Albera, Dionigi, John Eade (eds.) New Pathways in Pilgrimage Studies: Global Perspectives. (Routledge Studies in Pilgrimage, Religious Travel and Tourism), pp. 18-35. 2017 (b): Marcus BINGENHEIMER, Jen-Jou HUNG, Cheng-en HSIEH: “Stylometric Analysis of Chinese Buddhist texts - Do different Chinese translations of the Gaṇḍavyūha reflect stylistic features that are typical for their age?” Journal of the Japanese Association for Digital Humanities Vol. 2 (2017): 1-30. Open Access at the Journal Website or local copy here. 2017 (c): “Two Sūtras on Healing and Healers from the Chinese Canon” In: Salguero, Pierce (ed.) Buddhism & Medicine: An Anthology of Premodern Sources, New York: Columbia University Press, pp. 163-170. 2017 (d): Pierce SALGUERO, Robban TOLENO, William GIDDINGS, Joshua CAPITANIO, and Marcus BINGENHEIMER: “Buddhist Medicine in the Buddhist Canon: Selected Translations.” Asian Medicine 12 (2017): 1–18. 2016 (a) “‘Knowing the Paths of Pilgrimage’ - The Network of Pilgrimage Routes in 19th century China according to the Canxue zhijin 參學知津.” Review of Religion and Chinese Society Vol. 3-2 (Issue on Geospatial Studies on Chinese Religions): 189-222. Pre-print. 2016 (b): “The General and the Bodhisattva – Commander Hou Jigao Travels to Mount Putuo.” Journal of Chinese Buddhist Studies Vol.29 (2016): 129–161. Available on the journal website or local copy here. 2016 (c): Marcus BINGENHEIMER, Jen-Jou HUNG, Simon WILES, Bo-yong ZHANG. “Modeling East Asian Calendars in an Open Source Authority Database.” International Journal of Humanities and Arts Computing Vol. 10-2, pp. 127-144. DOI: 10.3366/ijhac.2016.0164. Local copy here. 2016 (d): Kin CHEUNG, Adam VALERIO, Vishma KUNU, Marcus BINGENHEIMER. “Chinese Religion(s): A Survey of Textbooks.” Studies in Chinese Religions Vol. 2-3 (2016): 315-328. Local copy here. 2015: “The Digital Archive of Buddhist Temple Gazetteers and Named Entity Recognition (NER) in Classical Chinese.” Lingua Sinica 1:8 (2015), pp. 1-19. [Springer link], [Local copy], [DOI: 10.1186/s40655-015-0007-3]. 2014 (a): “The History of the Manchu Buddhist Canon and First Steps towards its Digitization.” Central Asiatic Journal Vol. 56 (2012/2013), pp. 203-217. ISSN: 0008-9192. [PDF]. 2014 (b): “Collation strategies for the Buddhist canon - As seen in the frequency and impact of character variance in canonical editions of the Song Gaoseng Zhuan 宋高僧傳 (T.2061).” Journal of East Asian Publishing and Society Vol. 4-2 (2014), pp. 155-174. [Doi: 10.1163/22106286-12341260]. [PDF]. 2013: “Two Sūtras in the Chinese Saṃyuktāgama without Direct Pāli Parallel – Some remarks on how to identify ‘later additions’ to the corpus.” Buddhist Studies Review Vol. 30-2, pp. 201-214. [Doi: 10.1558/bsrv.v30i2.201]. Self-archived [PDF]. 2012 (a): “Bibliographical Notes on Buddhist Temple Gazetteers, their Prefaces and their Relationship to the Buddhist Canon.” Chung-hwa Buddhist Journal 25 (2012), pp. 49-84. ISSN:1017-7132. Available online local (PDF) or at the Journal website. 2011 (a): Marcus BINGENHEIMER, Jen-Jou HUNG, Simon WILES: "Social Network Visualization from TEI Data." Literary and Linguistic Computing 26(3), 2011, pp. 271-278. Doi: 10.1093/llc/fqr020. (SSCI) Free Access URL. How to encode and visualize social network information in Gaoseng zhuan 高僧傳 literature. 2011 (b): “Guanyu Bieyizaahanjing shuyu Yinguangbu songben de wenti 關於《別譯雜阿含經》屬於飲光部誦本的問題.” Hanyu foxue pinglun 汉语佛学评论 Vol.3 (2011): 187-198. 2011 (c): 洪振洲 Jen-Jou HUNG, 馬德偉 Marcus BINGENHEIMER, 許智偉 Jr-Wei SHIU: “Taiwan fojiao wenhua shuwei dianzang zhi fazhan 台灣佛教文化數位典藏之發展 - Digital Archives for the Study of Taiwanese Buddhism.” 教育資料與圖書館學 / Journal of Educational Media and Library Sciences Vol. 49:1 (49卷1期) (Fall 2011), pp. 103-133. ISSN: 1013-090X. PDF available here or at the journal website. 2010 (b): “Zhongguo fosizhi chutan ji shumu yanjiu 中國佛寺志初探及書目研究.” Hanyu foxue pinglun 汉语佛学评论 Vol.2 (2010), pp. 377-408. [PDF]. 2010 (c): Marcus BINGENHEIMER; Jen-Jou HUNG. “A Digital Archive of Buddhist Temple Gazetteers.” Digital Humanities 2010 Conference Abstracts. London: King's College London, 2010, p.282-284. ISBN 978-0-9565793-0-0. [PDF]. 2009 (a): “Writing history of Buddhist thought in the 20th century – Yinshun (1906-2005) in the context of Chinese Buddhist Historiography.” Journal of Global Buddhism Vol.10 (2009), pp.255-290. ISSN: 1527-6457. HTML version at the Journal of Global Buddhism website and local PDF version. 2009 (b): “More Suttas on Sakka and why the Shorter Chinese Saṃyukta-āgama should not be attributed to the Kāśyapīya school” Buddhist Studies Review, 26-2 (2009), pp.127–153. ISSN: 0265-2897, DOI: 10.1558/bsrv.v26i2.127. 2006 (a): “The Bieyi za ahan jing – Preliminary Findings.” Buddhist Studies Review, vol.23-1 (2006), pp.21-60. ISSN: 0265-2897. Part of the BZA project. 2004: “A Translation of the Tōdaiwajō tōseiden 唐大和上東征傳.” (Part 2) The Indian International Journal of Buddhist Studies No.5 (2004), 142-181. ISSN: 0972-4893. Revised [pdf Version 1 (2008)] here. 2003 (a): “Issues in the Use of Electronic Markup for the Comparative Analysis of Āgama Literature.” Chung-hwa Buddhist Studies 7 (2003), 361-383. ISSN: 1026-969X. Proposal for a combined digital edition of the Pāli-Chinese Agama Literature using TEI. This later became the BZA project. 2003 (b): “A Translation of the Tōdaiwajō tōseiden 唐大和上東征傳.” (Part 1) The Indian International Journal of Buddhist Studies No.4 (2003), 168-189. ISSN: 0972-4893. Annotated translation of the journey of the monk Jianzhen 鑑真 (jpn. Ganjin) to Japan. Revised [pdf Version 1 (2008)]. 2002: “Kulturelle Identität aus Buddhistischer Sicht – Alte Erfahrungen einer Weltreligion mit der Gegenwart.” Fu Jen University (Hrsg. ): Globalisierung und Identität. Taipei: Fu Jen University, 2002, 292-308. ISBN: 957-0439-41-6. 2012: Christoph ANDERL, Christian WITTERN, Marcus BINGENHEIMER (Guest Editors) : Chung-hwa Buddhist Journal - Special Edition: Digital Text and Digital Resources. Vol 25. “Buddhist Stone Sutras in China, Sichuan Province” Vols. 1-3. by Lothar Ledderose, Suey-ling Tsai, Claudia Wenzel, and Hua Sun. T’oung Pao Vol. 104-1-3 (2018): 196-200. “Reinventing the Tripitaka - Transformation of the Buddhist Canon in Modern East Asia” by Jiang Wu and Greg Wilkinson. Reading Religion, 2017. “Heart of Buddha, Heart of China: The Life of Tanxu, a Twentieth Century Monk” by James Carter. Journal of Chinese Religion Vol. 40 (2012), pp. 97-99. “Burning for the Buddha” by James A. Benn. The Journal of Religion Vol. 88 (April 2008), pp. 269–270. “The Politics of Buddhist Organizations in Taiwan” by André Laliberté. Pacific Affairs Vol. 78 (July 2005), pp.300-301. 2018.04.25	Workshop @ Stanford University: “Using Temple Gazetteers for Research in Chinese Buddhist History” Workshop website. 2017.08.21: Presentation @ 18th Congress of the IABS, University of Toronto: "Disguised as Monks in Ming and Qing China: Glimpses and Anecdotal Evidence"
2017.06.12: Presentation @ Woodenfish Forum on Buddhism and New Technology: Cyborgs, Artificial Intelligence and Beyond, Shanghai: "Social Networks in the Study of Chinese Buddhist History"
2016.05.03-05 3-day Workshop @ National University of Singapore: "Introduction to DH Methods for Chinese Humanities." 2015.09.24-25 Workshop @ Tibetan Buddhist Resource Center's Buddhist Digital Archive Initiative (BDAI) Advisors' meeting, Berkeley ACLS.